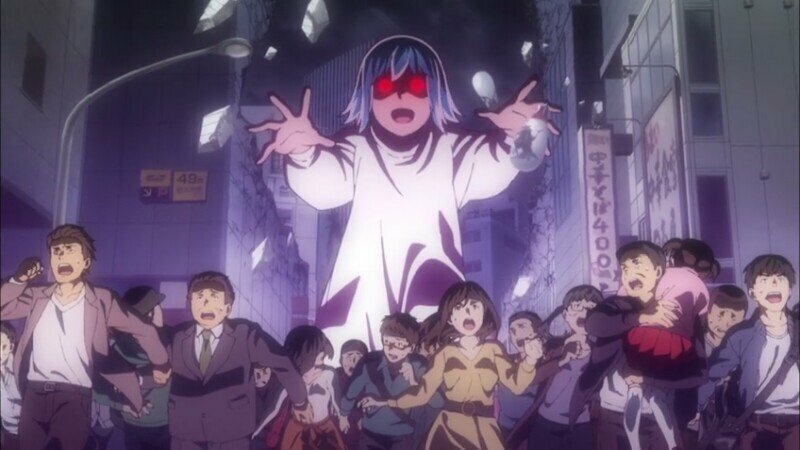 Hinamatsuri episode 2-This Is how You Have a Superpower Battle! 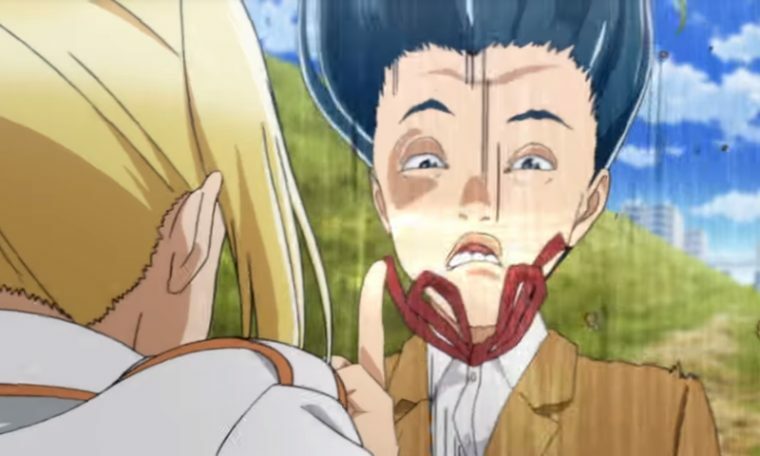 So my prediction in the last article of Hinamatsuri was wrong. As that turned out to be a simple comical relief. Hina has managed to become a settled character. 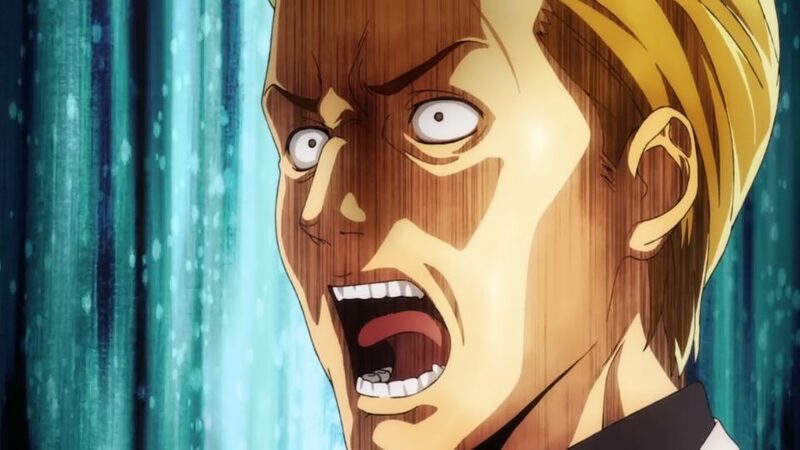 And now for this Hinamatsuri episode 2. Moving on to this actual Hinamatsuri episode 2 a new character is introduced, named “Anzu”. A blonde girl that has the same powers as Hina. She, like Hina, falls from the sky on a metal capsule. Bare naked at it, yet, I guess, thankfully for her, the typical Japanese gang appears. She uses her powers to get a full control of that event, as the gang gets pissed off. Mainly due to Anzu’s rude expression and harsh words towards them. None the less, she uses her powers, throws all the gang into the ground and leaves off with the leader’s clothes. Glad to tell you this, the opening is so amazing, has a definite good tune to it. It portions the scenes including the characters pretty well. As the opening ends, news breaks out to Nitta’s hears. That there have been disturbances lately. He immediately thinks that it was Hina. Although he quickly has a self-reminder that tells him something. He and Hina were together the last night. So no way that Hina was responsible for any disturbance this time. This raises the question, as to who has done it then? Nitta and his work partner, more like a close friend, enter a bar. Then they see a little girl with the victim’s jacket. Nitta quickly catches up to the matter. That being, that girl being the responsible. Anzu starts by leaving the bar without paying. But the bar attender goes after her, Nitta knew this was bad. So he offers to pay it for her. Doing so prevents another break-off. Nitta also realizes that he might have just saved the whole nation. He imagines a dystopia where Hina would rule the humans just because none gave her food. A hilarious possibility. 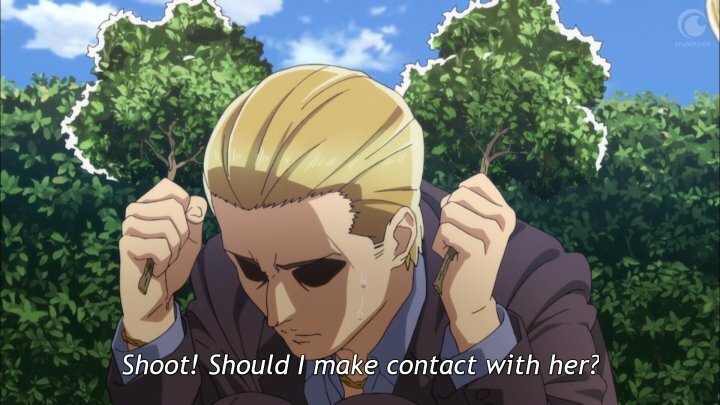 This Hinamatsuri episode 2 has high traits of comedy. Anyways, Nitta decides to not lose any more time. He leaves his ramen meal to his friend, to make an investigation, essentially stalking Anzu. By doing so, he reaches a park, where Anzu is surrounded by the Gang members. They start to want something back, but the obvious outcome was drawn. Every single gang member falls in a hilarious way, as Nitta gets scared while doing this operation. One thing that Nitta hears, is that Anzu wishes to meet Hina. And without any further ado, Nitta decides to bring Hina to where she is. As to how he got to know where she was, Nitta’s friend made a deal with an old man to find Anzu’s location. Classic Yakuza things, but it wasn’t for a dark motive, as Nitta’s friend says. Hina and Anzu meet up, apparently, they both know each other. So they are connected by a similar past for the most part. Nitta realizes quickly that it would turn into a disaster if they both unleashed their powers out in the wild. So he proposes a rock-paper-scissors game( Janken). Each time one of them won a trade of the Janken, the winner gets a chance to use their power. The challenge begins, Anzu wins the first trade, she tries to make use of her power. But as Anzu wants, Hina doesn’t obey, mainly to look up, still, Nitta puts a stop and issues another round. Anzu wins this one as well. She stays persistent to her desire, to make Hina look up, yet fails miserably while trying so. The last round of the Janken comes in, this time Hina wins. And not for the surprise, she overwhelms Anzu to the point of no return. Twisting Anzu’s neck along the way, meanwhile, Nitta decides to have his comical outburst. Being a little mad for losing, Anzu decides to have a bit of Hina’s hair. Hina rolls on the grass as she is in pain. Anzu does say that it’s for “them” to think that she is dead. So perhaps she came with that mission from “them”. Anyhow, after that challenge being won by Hina, Anzu says she wants to hang out before going. They do all sorts of things before, even playing video games. I think what I found the most enjoyable out of this first half of this episode was Nitta. His reactions and every single punch line were hilarious. 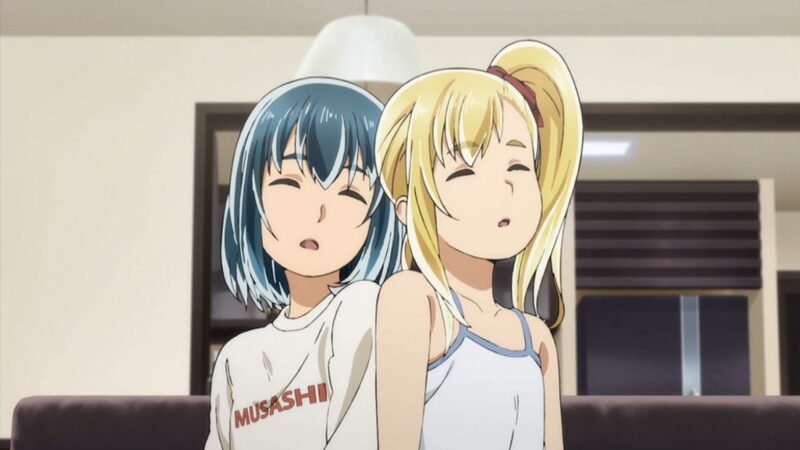 To finish this first half of this Hinamatsuri episode 2, Anzu tries to press the ball to get her back to the place she came from. Yet only water comes from it, as she becomes homeless once again. I think this previews the upcoming episode title, that being: “Hobo Life 101”. Now as for the second half of the episode, it starts off plain and simple. Nitta is in a bar but something is different. No women want anything to do with him. In fact, he wonders where his womanizer skills have warped into to. He asks the women around him why they didn’t want anything to do with him. They all look at Hina, saying that Nitta gives her so much love by always being with his daughter. Even though it isn’t his daughter by blood, it is really identical to him. After coming to that conclusion, Nitta breaks out in the one hilarious way. He decides to get back to his old ways. So what he does, is to give Hina fish every dinner. He uses that as a bait to go out, and he does it with fashion. Nitta manages to spend more time with women but it’s not long until Hina suspects it. As each day goes by, Hina keeps on staying home due to Nitta orders. That’s not for long as Hina invites her school friend to stalk up Nitta. The stalking almost goes well. Thing is, Hina gets distracted by temptation, in this case, food. When she said temptation I thought she was referring to women. Yet not, she was referring to food. Due to that distraction, they lose track of Nitta as he goes off to the bar once again. They eventually meet up as Hina’s friend turns out to be a great bartender, the old man even says that she was born for it. Then Nitta shows up in the bar seeking his female friend. I believe they make a good couple. I want that ship to sail due to one reason. In the opening, they look outstanding together. They form the figure of mother and father perfectly. 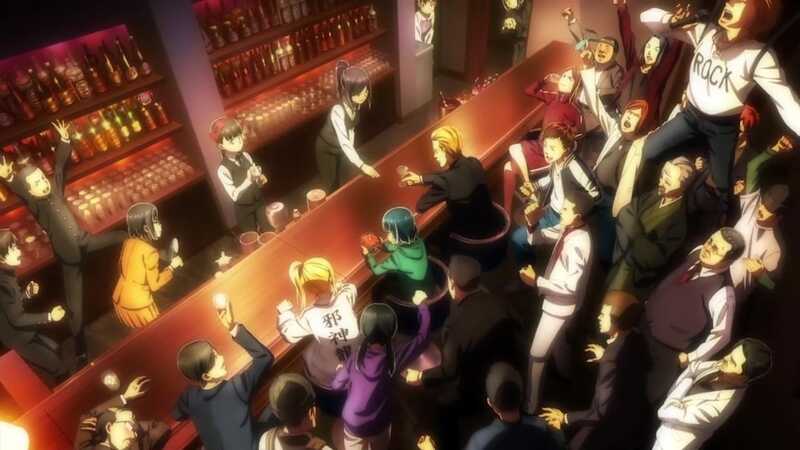 Nitta then comes to the conclusion to invite all the people in there, including Hina and her friend to a bar. To have fun simply. What was hilarious about it, was that Hina used her powers. The fact that everyone believed to be an illusion like Nitta told was priceless yet understandable because they were drunk. With that, this Hinamatsuri episode 2 ends in a very enjoyable way. 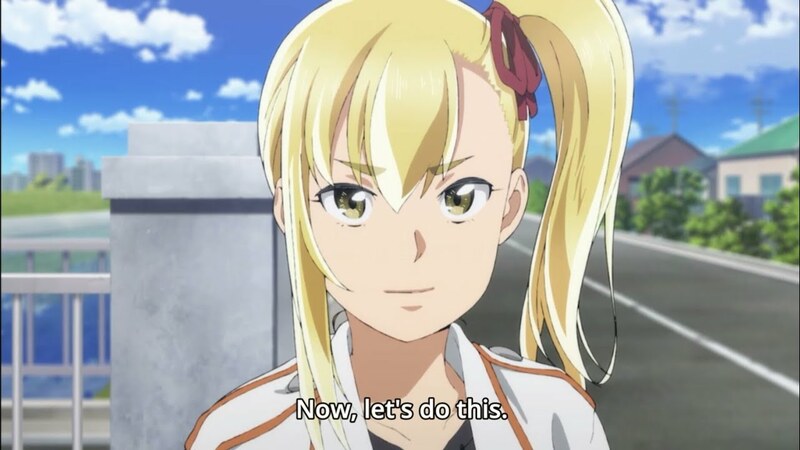 So down below give me your thoughts on this Hinamatsuri episode 2 or just this anime in general. For more concrete information about this anime, go here. While you are at it, check this Highschool DxD article as well.